When creating an SMS in YoungCRM, you can insert so-called 'shortcodes'. When inserting a shortcode, it's replaced by personal information associated with the receiver's ID in YoungCRM. (even though that is the case). 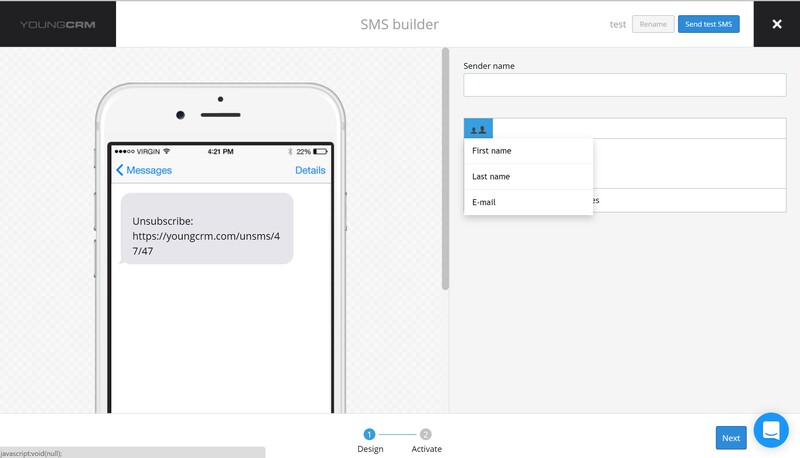 When designing your SMS, you can insert shortcodes. You insert the shortcodes by clicking the icon as seen in the picture below and select the shortcodes you would like to use. When the SMS is sent, first name and last name will be replaced with the information the person signed up with via YoungCRM. For instance, if the receiver's name is 'John Doe', this name will be inserted in the SMS. NOTE: Remember to make a space between the two shortcodes 'First name' and 'Last name' if used immediately after each other or else, they will be connected in one name.